Take the first step on the road to a career in the Film industry! This intensive Introductory Course provides an immersive introduction to the exciting world of professional film production. You will be working with HD cameras and professional editing equipment throughout the course and will receive hands-on experience in writing, shooting, directing and editing your own films. You will study the fundamental aspects of visual storytelling in Pulse College’s professional film production facilities in the heart of Dublin, learning from practicing industry professionals from disciplines including screenwriting, production, sound, cinematography and post-production. 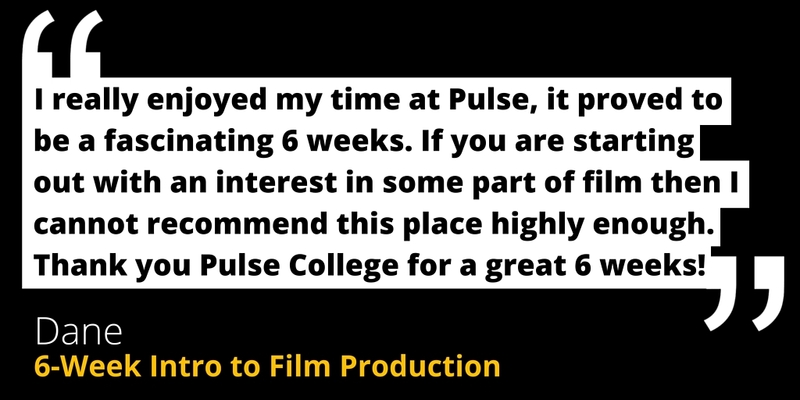 On completion of this course you will have a solid understanding of film production techniques, and will be able to go on to study Pulse College’s Advanced Diploma in Film Production. Prospective students should display an enthusiasm for film, and a desire to take ideas from initial concept to finished product. There are no minimum academic requirements for acceptance onto this course.